The new iPhone 8 and X that people were anxiously waiting for were availed a while back, and most Apple fans have already bought one to enjoy the new phones generation with its pack of cool new features. The first thing that most users do is to sync the data and necessary files from their old iPhone to the new iPhone 8/X. Photos are undoubtedly one of the media content one is very eager to transfer, because they are very crucial files that help us keep the best moments and memories intact thus the need to keep them handy and easily accessible. This article shows you different and the simplest ways to transfer photos to your new iPhone 8/X. Step 1. Both on the old iDevice and the new iPhone 8/X open the control center by swiping up from the bottom of the screen. Step 2. Then on each turn on AirDrop and choose "Contacts Only" or "Everyone" depending on your preference. Step 3. After you have turned on AirDrop go to the Photos App on the old iPhone that you want to transfer photos from and then select all the photos you want to transfer to your new iPhone 8/X. Step 4. Tap on the “Share” button and choose your new iDevice’s name in the Airdrop section after which you will get a prompt on the iPhone 8/X. Step 5. Click "Accept" to start receiving the photos. The other simple way that you can use to move photos from your old iPhone to the new iPhone 8/X is with iCloud. Step 1. Ensure that both of your devices’, the former iPhone and the new iphone8/X, batteries are charged up and then connect them to a Wi-Fi. Step 2. Sign into both of the iDevices with your iCloud account which should be the same in this case. Step 3. Open the Settings App and then tap on [Your Name] > iCloud > Photos > Upload to My Photo Stream you have a device running iOS 10.3 or later. 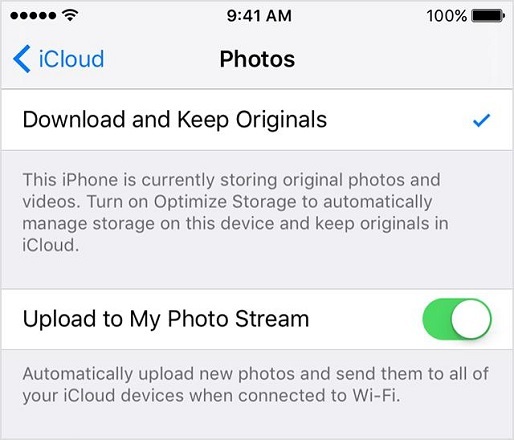 In case it has an earlier iOS version then just go to the Settings App > iCloud > Photos > My Photo Stream. Step 4. Wait for a little while for the photos to be synced and the check your iPhone 8/X Photos App to see the transferred images. iMyFone Umate Pro is a third-party photo transfer software, trusted by millions of iOS users. It has a one click back up which you can use to manage and move photos from all your iDevices to computer eliminating the worry of losing any of your fun moments. 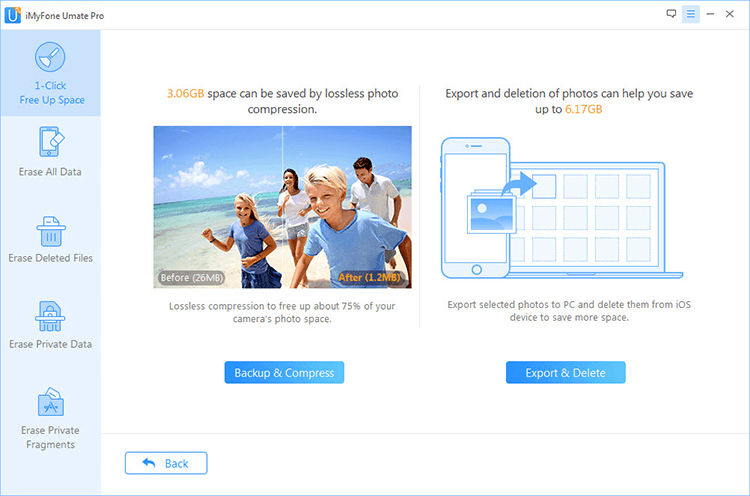 As a photo manager, it helps you in many ways as you can export, delete your photos directly from PC, permanently erase photos and even clear any previously deleted photo fragments. Can easily backup up and transfer your photos to your PC ensuring that images that preserve your precious memories are kept for future reference. Can permanently erase any photos with 100% unrecoverable. It also offers the option of bulk deleting photos which saves one much time in managing and organizing the photos. Can erase previously deleted photos that are normally hidden and which can be recovered by use of recovery tools thus ensuring one’s personal information privacy is guaranteed. Step 1. Using a compatible USB cable, connect your old iPhone to your computer and then launch Umate Pro. Step 2. Once your phone is detected, go to Umate Pro home interface and select the “One Click to Free Up Space” Mode. Step 3. Choose the "Photos" which is on the bottom, then click “Back up & Compress”. Done!